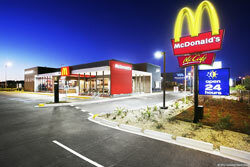 A McDonald’s franchise is a proven business model, in fact in Australia, about 80 per cent of our restaurants are owned and operated by local franchisees. The care we take in recruiting, screening, training, developing and retaining qualified franchisees has been integral to both our own and our franchisees’ growth and success. It’s a real partnership, in fact, we like to say it’s “a little bit of you and a little bit of us”. What makes our system unique is our business model of the three legged stool. This concept of a partnership between the three legs of the stool - franchisees, suppliers and our corporate staff is one that ensures our strength. For McDonald’s to continue its success, it is crucial that dynamic individuals join our system - people that are able to create high performance environments within their organisation. They must also be great brand ambassadors and run outstanding restaurants to deliver on our brand promise. In 1971, we opened our first restaurant in a Sydney suburb called Yagoona. Today there are over 920 McDonald’s across Australia, with over 90,000 people employed in our restaurants and management offices. With more than 1.7 million people coming through our restaurants every day, it’s their trust in our integrity that keeps them coming back. We earn that trust by respecting our customers and employees, and delivering outstanding quality, service, cleanliness and value (QSC&V). What's involved and what does it take to become a McDonald’s franchisee? You’re able to commit to our Registered Applicant Training Program for 9 months. The training program is full-time and unpaid. You’re able to make a significant financial investment – upwards of $700,000 unencumbered funds. You will commit yourself full time to the business rather than being an absentee investor. You aspire to become an integral part of your community as an employer, service provider, local business leader and an advocate of the McDonald’s brand. McDonald’s is regularly seeking motivated, passionate and dedicated individuals to join our system.